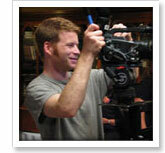 Shooting documentaries has always been close to the heart for DP Mark Simon. At Brown University he started an evening news program on the student TV station. Just out of school he took his first steps into the film industry of his hometown Seattle by lighting and shooting interviews for the City of Seattle and local arts organizations, and has been shooting film and video for over twelve years since. From lighting Sherman Alexis' feature The Business of Fancydancing and Alex Zedicoff's soon to be released HD feature A Moveable Feast, to shooting videos for Microsoft and Hewlett Packard, to working on documentaries for PBS and the History Channel, he has developed a keen eye for light and motion, a deep love for the medium of the moving image, and an intense curiosity about finding and telling the stories of the real world. His work lately has involved a long-term documentation of the remodeling of a 1908 craftsman home in Mt. Baker for TBS, shooting Al Gore for the Apollo PAC, and videos for Microsoft. He is intensely personally interested in the dynamics of committed relationships and the painful but beautiful discovery and growth they can bring when the partners come face to face with the reality of who they are.